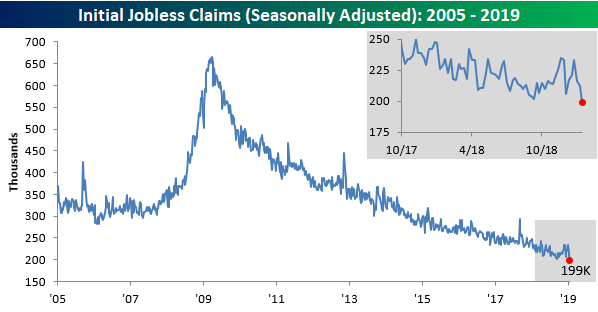 We’ve said it countless times over the last several years, and today we’re forced to say it again regarding jobless claims. Wow! This week’s report on first time claims not only came in lower than expected, but it also dropped below 200K to 199K. Not since November 1969 has weekly jobless claims print come in with a ‘one’ handle. 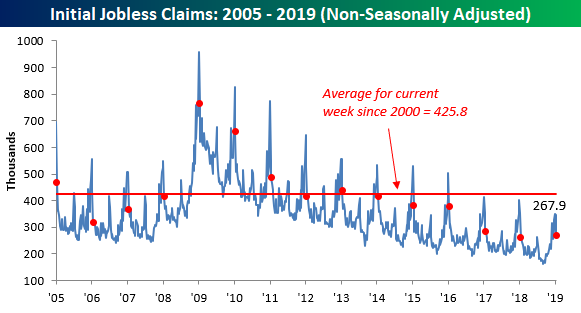 This week’s report represents a record 203 straight weeks that jobless claims have been at or below 300K, 68 straight weeks of at or below 250K readings, and finally one week below 200K! 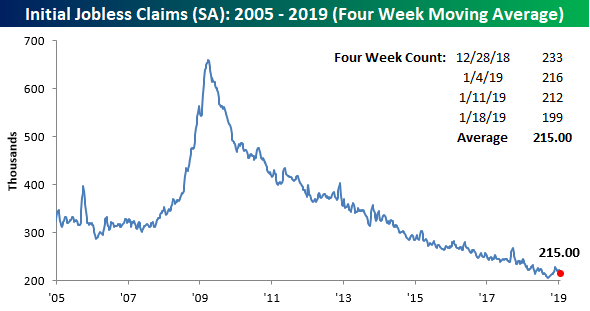 With this week’s large decline in claims, the four-week moving average also dropped by over 5K to 215K. That’s still 9K above the multi-decade low of 206K from back in September but will continue to drop further next week as we are dropping another large weekly reading from the four-week count. On a non-seasonally adjusted (NSA) basis, claims also saw a large decline falling to 267.9K. That’s more than 150K below the average of 425.8% for the current week of the year dating back to 2000, but is actually slightly higher than the reading for the same week last year (260.1K). So, it’s the lowest seasonally adjusted reading in a half-century, but not nearly as extreme on an NSA basis.